Blood pressure, heart rate, respiratory rate, body temperature, and . . . pain? Ah, the fifth vital sign, added in the 1990’s to improve pain management and what some experts are now blaming for the opioid crisis. The American Medical Association and the American Academy of Physicians dropped pain as a vital sign in 2016, but this was followed by an outcry of protest from the American Academy of Pain Medicine (AAPM). Lynn Webster, former AAPM president argues that removing pain as the fifth vital sign “suggests that if we just ignore pain then we won’t have to deal with it and the opioid crisis will disappear." Just like it didn’t work when I was younger with my little sister, pain is not going to go away if we just ignore it. So, if we can’t throw opioids at chronic pain and we can’t ignore it, what are we supposed to do?! Interdisciplinary Pain Management to the rescue! Interdisciplinary Treatment of Chronic Pain employs a biopsychosocial approach and uses multiple disciplines working collaboratively to treat and manage patients’ pain. Research has shown that this is a highly effective way to manage chronic pain. Chronic pain is mostly due to changes in the nervous system, which in turn, affect function and quality of life. Interdisciplinary Pain Management programs focus primarily on reconditioning and psychological coping strategies to ensure that chronic pain does not take over a person’s life. The goal is to restore the person to their maximum level of comfort and function. Team members include: the patient (the patient must be fully engaged for treatment to work), Physicians, Nurses, Physical Therapists, Psychologists, Occupational Therapists, Social Workers, and Vocational Counselors. Each discipline involved is specifically trained to work with patients with chronic pain and each have roles that can sometimes overlap, but never replace each other. All team members monitor treatment outcomes and attend interdisciplinary treatment team meetings to review patient progress. Education for the patient and family is a central focus of the program and is provided by all disciplines. Treatment can be done in an inpatient or outpatient setting and each discipline can take on different roles as needed by the interdisciplinary team and patient. Is this patient appropriate for Interdisciplinary Pain Management? Is this what he or she would benefit most from? Sometimes patients are not appropriate for Interdisciplinary Pain Management. Patients may not be receptive to pain education and treatment. Often, patients were drug seeking, seeking a “cure” for their pain, or seeking another surgery to “fix” their problem. For treatment to be successful, patients need to accept that their pain is not curable and ready to manage the pain. Would this patient benefit more from a different treatment? In some cases, the patient would benefit more from another kind of treatment, i.e. an orthopedic surgery or vascular surgery first. Sometimes, patients needed traditional therapy to recover from an acute injury or improve balance before proceeding with interdisciplinary pain treatment. Sometimes, the patient would need more intensive psychological intervention than the program could offer and these patients would be referred out to other Psychologists. What specific interventions would be most benefit from? Often, patients would benefit from OT, PT, and Psychology, but sometimes the patients would benefit from only one or two out of the three. Individually, each clinician would determine the discipline specific treatment plan, just as with any other patient. We met once a week and discussed each of the above questions for each patient. Once we determined the treatment plan, we would discuss changes in patients’ goals, treatment outcomes, and appropriateness for treatment on an ongoing basis. Chronic pain is generally not curable, and this is one of the biggest barriers clinicians must help patients overcome. The desired outcome for patients with chronic pain is to live fulfilling lives in the presence of pain. Most patients do have a reduction in pain, but the biggest goal is to help patients restore their quality of life. The most rewarding outcome for patients and clinicians is to take a patient who is depressed or angry watch him or her transform into a laughing, kind person again by the end of treatment. Although it seems daunting and sometimes impossible when first starting treatment, it does happen and it is AMAZING. Unfortunately, the number of Interdisciplinary treatment programs in the United States are dwindling and many clinicians and patients do not know this type of treatment exists. Patients go years without the appropriate treatment, hopping from doctor to doctor, surgeon to surgeon, seeking answers and to no avail. When patients finally find out about treatment, their chronic pain has caused great disability and they have to travel hundreds of miles to seek treatment. I worked at University of Pittsburgh Medical Center’s Interdisciplinary Pain Management Program for four years and we had patients who would travel from hours away in Pennsylvania or Ohio every week just to get treatment. More clinicians need to be aware of programs in their area and recommend this treatment when pain goes from acute to chronic. The earlier a patient gets the right treatment, the better outcomes will be. As a Physical Therapist, even if you do not have an interest in treating chronic pain, you should know the treatments available and when to refer to the appropriate treatment programs. If a patient consistently demonstrates these behaviors, they may benefit in an Interdisciplinary treatment program. Just remember, the patient needs to first accept that their chronic pain cannot be cured, but with help, they can lead a fulfilling life with pain. 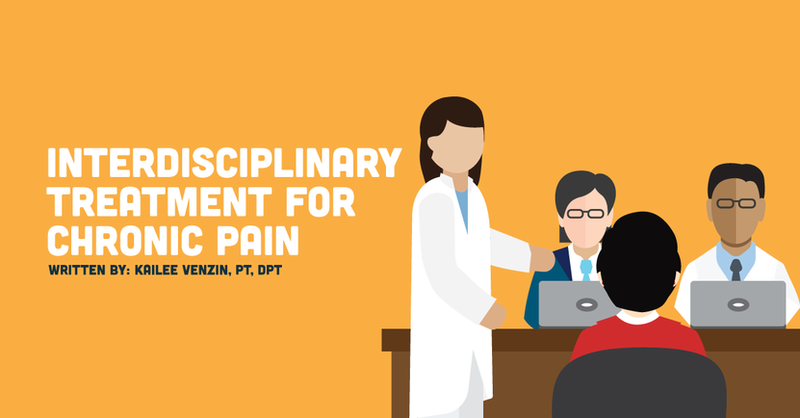 Do you work with a team for interdisciplinary pain management? How does your team work together? Tell us about it in the comments!